I doubt President Obama will be spending today on the East Gallatin River near Bozeman, Mont., fly-fishing for trout. But he did spend a day in August 2009 on the East Gallatin River fly-fishing for trout, to make good on a campaign promise. It was during the presidential campaign while in Montana when he promised to come back and do some fly-fishing. In town for a town hall meeting about health care, he arranged a private fly-fishing outing with the Vermillion brothers, as related on About.com. Dan and Pat Vermillion run the Sweetwater Travel and Fly Shop in Livingston, Mont. They became the first to take President Obama and his staff fly-fishing. Dan guided the president one-on-one while Pat guided Obama staffers Jim Messina and Robert Gibbs. Obama managed to hook six fish but was unable to land any of them. His staffers one-upped the president by each landing a fish. They spent 2 1/2 hours on the water and fished through intermittent thunderstorms. "It was incredible to see the president, enjoying the sport to which I have devoted so much of my life," Pat Vermillion said. "I think it is a little optimistic to think that he will feel a connection to our sport after only 2 1/2 hours of fishing. "However, he sincerely seemed to enjoy himself. The fact that he continued to fish in the rain was testament to that. I hope he does come back to fish with us and take up fly-fishing seriously. He seemed genuinely interested in coming back. I feel that fishing has an amazing ability to connect a person to the outdoors and hopefully to appreciate the need to conserve it." 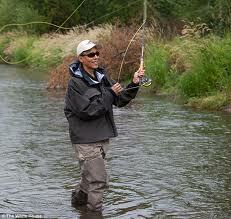 Who knows, maybe when Obama decides to hang up his basketball sneakers he'll swap them out for a pair of waders.